Alex Ageneau and Jet Tila are back again for another rousing rendition of Bistronomics, this time entitled "Lucky 13." Created in March of this year, Bistronomics is an on-going pop-up restaurant experiment embodying the concept of bistronomy, aiming to present contemporary fine dining fare at reasonable price points. Since v2.0 back in April, a lot has happened with the duo. 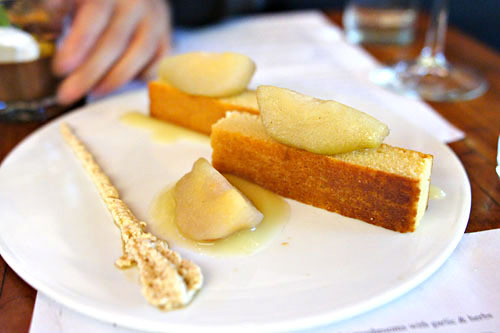 Following Ageneau's departure from The Royce at the end of July, they held Bistronomics 3.0 at Breadbar in August. Tila, for his part, competed on Iron Chef America against Masaharu Morimoto in "Battle Seaweed," losing the competition 55-51. Like Ageneau, Tila also parted ways with his restaurant, leaving Wazuzu at The Wynn in August, though he remains on in a sort of consulting role until a replacement is found. He also returned to Vegas on September 26th for a one-night-only pop-up at Joe Swan's Marche Bacchus French Bistro & Wine Shop. 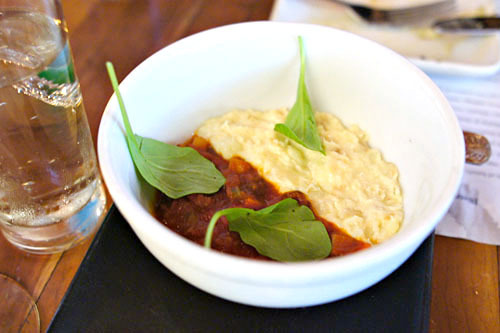 Bistronomics "4.0" kicked off on October 8th at BreadBar Century City, and will run throughout the month on weekends, wrapping up on the 29th. This round of Bistronomics highlights a blend of contemporary and classic French flavors, but unlike previous iterations, will be strictly à la carte instead of prix fixe. Curiously, given that the series was named "Lucky 13," I fully expected there to be 13 items on the menu, but alas, I counted only 11. Nonetheless, for this hosted dinner, we were provided one of each item on the menu so we could sample everything, along with appropriate wine pairings. Click for a larger version. Akili Steward (whom you may recall from Magnum and The Royce) was in charge of libations this time around, and in addition to wine, he also had a couple of cocktails in store for us. 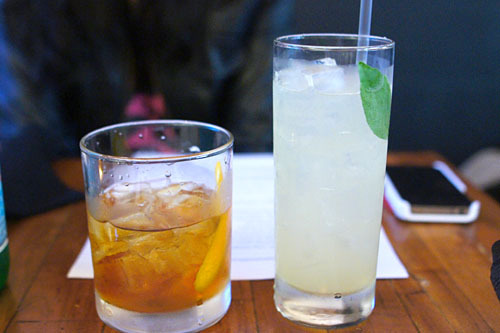 On the left is the Lucky 13, a blend of gin, Cynar, and St. Germain, finished with orange peel. It was delectable, with a great bittersweet relish to complement the gin, along with lovely overarching notes of citrus. The Basil Margarita, with tequila, fleur de sel, agave, and lime, was also quite delicious, a smart riff on the traditional cocktail with a delightful complexity courtesy of the herb. 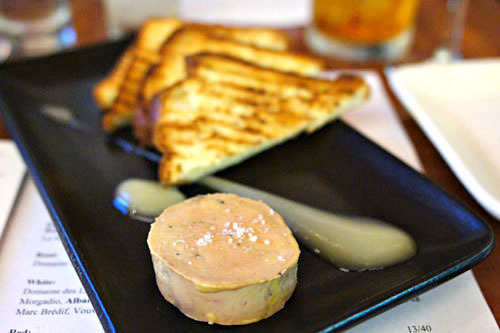 A classic presentation of foie gras made up our first course. The torchon was actually quite nice, very delicate and balanced, with a lovely sprinkle of salt on top to really bring out the flavors, while a purée of apple added a restrained bit of sweetness to things. Toasted brioche, of course, made for a perfect base on which to spread the foie. 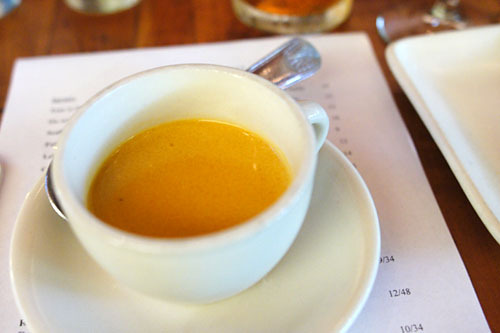 Lobster bisque was traditional in essence, showing off deep, intoxicating flavors of lobster augmented by a lush creaminess, though I didn't get much from the use of shiitakes. What I believe were water chestnuts, though, added a pleasant crunchiness to the soup, mixing things up texturally. A scallop arrived rather striking in presentation, dyed a robust shade of red. It was expertly cooked to a wonderful consistency, and conveyed a delectable salinity perked up by a hint of beet-y tang. Crisp, crunchy leeks, meanwhile, served to provide a point of levity, though my favorite element here was the Thai basil, with added fantastic aromatics to the dish that just tied everything together. The paired Vouvray was especially effective with this course. This next course was supposedly based on a recipe from Chef Ageneau's grandmother, and was just as comforting and satisfying as you'd expect. Though the dish was unabashedly creamy, the inherent brine of the various seafood items was keenly presented, deftly set off by the leeks and mushrooms and faultlessly paired with the Picpoul de Pinet. Yum. 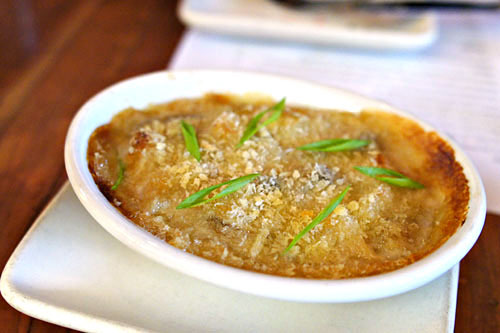 I've become quite the fan of brandade, and this version certainly did not disappoint. The essence of the salt cod was definitely present, but at the same time, it appeared subdued, adroitly moderated by the piquancy of the accompanying chorizo ragù and greenery. Ageneau is ostensibly a big fan of salsify, and this next, Voltaggio-esque course of the confit'd vegetable was his strongest of the night. The salsify was beautifully presented here, showing off a great starchy salinity that played perfectly with the earthy maitakes. At the same time, the herbs and garlic served to temper the weight of the root veggie. 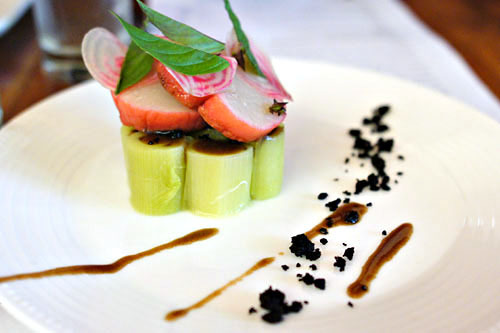 Creative, pretty, and quite possibly the best salsify dish that I've ever had. Slow-cooked oxtail conveyed prototypically deep, dark, bovine flavors. 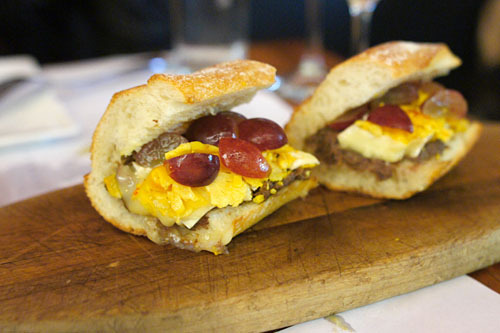 The meat made sense with the brie, but the cheese was a bit domineering; less would've been more in this case. The grapes and cauliflower, meanwhile, served to offset the gravity of the meat-cheese combo, but I wanted more of those tangy flavors to really balance out the dish. Pork belly was another highlight of the meal. Cooked to an almost falling-apart tender consistency, the meat displayed plenty of pork-y goodness and was gorgeously countered by the lightness of the cabbage and radish. 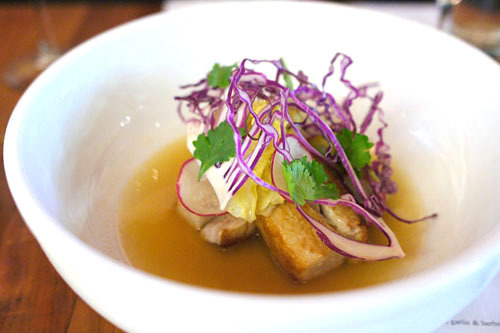 Meanwhile, a sesame-based broth added a beautiful bit of Asian-inspired flair to the dish. 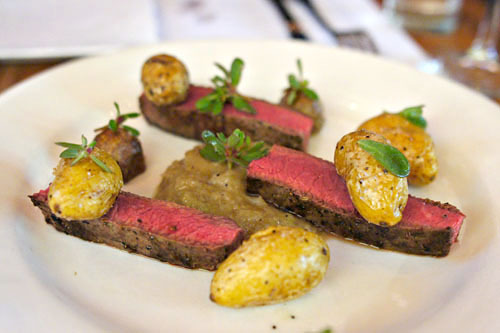 A heady Cabernet Franc paired well with our final savory course, the Chef's requisite "steak & potatoes" dish. Beef was expertly prepared, and went superbly with the peewees, while purslane provided a wonderful counterpoint to the weight of the meat. However, I wasn't quite as keen on the shallot-whiskey condiment though, finding it a tad too sweet. A lush, sugary ganache of chocolate was tarted up by slices of orange, with sprigs of lemon basil adding a great citrus-y accent to things. 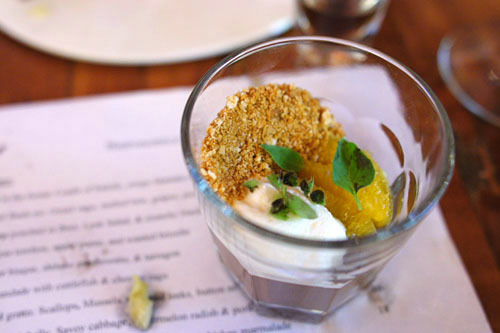 The gingerbread, meanwhile, served to provide some textural variation to the dessert. We ended things with a clafoutis, a traditional fruit dessert from France. The overtly saccharine pear flavors here actually went really well with the astringency of the coffee cream, but I wanted by the cake itself to be moister, with perhaps some fruit bits actually incorporated in. 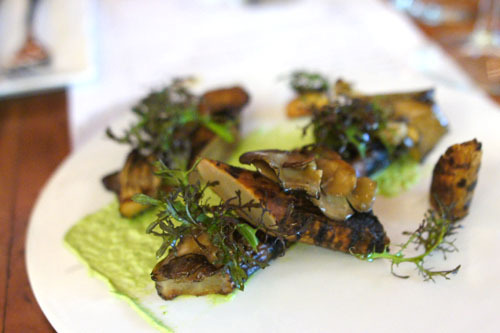 With Bistronomics, Ageneau and Tila wanted to engender affordable fine dining, and in that regard, they were fairly successful. Dishes were, for the most part, on point, but the highlights of the meal came when Ageneau stretched himself with his flavors and his plating, composing dishes such as the "tree in the forest" and the beet-poached scallop; I really hope that he moves more toward this direction in the future. As for what's next for the twosome, there's definitely the possibility of more Bistronomics pop-ups, and Tila has announced that they're looking for a permanent space in Los Angeles, with hopes to open sometime next year. We shall see. Fun running into you on Saturday Kevin. 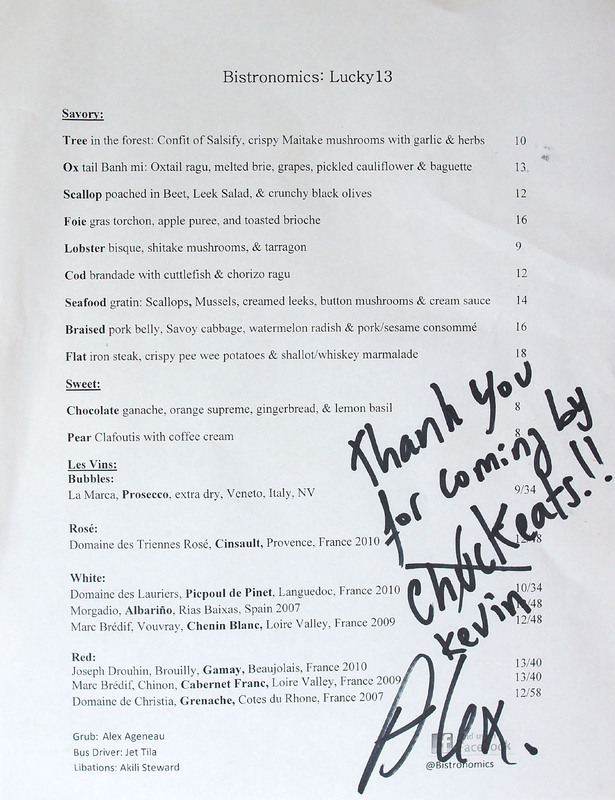 Couldn't help but laugh when I saw that signed menu. Yeah, the interesting bit is that Chuckeats was one of the blogs that inspired me to do my own early, hence the name.